Transhubservices is a Unit of Rhema Transcription Service you can count on for Quality and Turnaround Time. We provide variety of services including Medical, Business, Legal, Sermon, and Engineering Transcription. We serve Clients all over the United States. We are providing High Quality transcription while maintaining Security and TAT at Affordable Prices. We provide our clients the option to use digital recorders, Toll Free lines or both. We prepare customized templates based on client requirements. 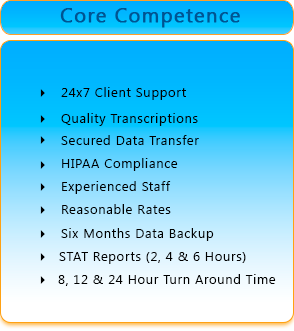 The transcripts are delivered to clients using 256 bit secured file transfer. Referrals provided upon request.